Disruptive technology to provide piracy free videos at affordable rates. Aavishkar technologies launch a new entertainment app called FOPI. With the Fopi app, people can access movies, songs, TV serials, podcasts and books at an affordable fee. 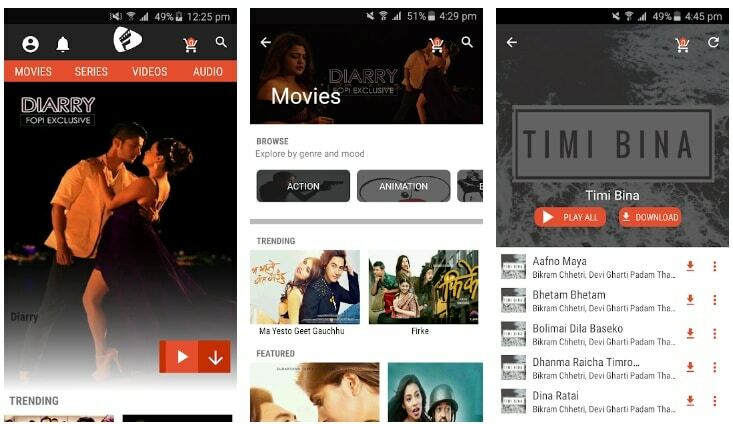 The app is mainly a video on demand streaming service to watch newest Nepali movies. People can buy the largest library of contents from Fopi Pasal or digital wallets like esewa or Fopi payment balance. Find more information about Fopi app here. Fopi is a piracy free entertainment app which provides authentic Nepali and regional movies, songs, videos, and TV series. They say Fopi app is a one-stop solution for audio and video streaming in Nepal. The contents of the platform are available online and offline but they are only available in their mobile only. It happens as it does not allow to share, copy the downloaded files. The app not only prevents privacy but also create business opportunities for the real artists through the app. Although they only have Nepali contents, they are in the process to add international contents. Although there are some free contents, the cost of new Nepali movie ranges from Rs 5 to Rs 25. They say they will add the latest movies with each daily update. You can download Fopi app in Android from the Google play store here. They will soon bring the app in iOS. People can buy content in the app either by going to nearest FOPI pasal offline or through the internet (using Fopi balance or eSewa) at your home. As known, Fopi is working with Nepal Telecom for the payment through mobile balance. They may even launch some specific package to stream contents in Fopi app. There are three different products of Fopi. Agent for distribution: FOPI Pasal. Fopi Pasal is an authorized agent for the distribution of available songs and videos from the platform. This system is a disruptive technology to protect the rights of content holders and provide a sound quality affordable platform for the consumers in Nepal keeping into consideration the cost of data, data network viability, and speed. FOPI Pasale is the download enabled assistance shop who would help consumer download quality, legitimate contents of their choice in few minutes. The users will not be able to transfer or share the content or even stream the content across other devices than the device they have made a purchase for. Any Shop with an internet connection can apply to be a Fopi PASALE. Find the Fopi pasal locations here. Another service of Fopi entertainment is Fopi Hotspot. The locally hosted media streaming application provides authentic Nepali movies, songs, videos, and series. The content catalog is updated every fifteen days for the users and they will be notified for the same. The local networks are hosted in restaurants, accommodation hotels, and public commute. They will put the extensions of such hotspot in other leisure areas like park and waiting stations of airports and buses. This offline video streaming creates an extremely new kind of platform for the content producer and the user to connect. People in Nepal have issues of connectivity, speed and cost with the Internet and is not within reach to a lot of consumers to stream content using the data.